Vigorous bush plant, with an open habit, leading to easy harvest. 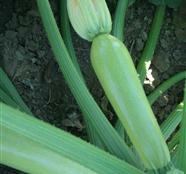 The cylindrical 16 - 18 cm long fruits are speckled grey to green in color. Excellent disease tolerance, with hihg uniform yield throughout the season.